Brigadier General Bruce E. Oliveira assumed duties as Commander, Land Component Command for the Hawaii National Guard. He is responsible for formulating, developing, and coordinating all programs, policies, and plans affecting the Hawaii Army National Guard, ensuring the force is capable of executing global unified land operations and community based domestic operations. General Oliveira enlisted in the Hawaii Army National Guard on August 1, 1978. He was commissioned as a second lieutenant upon graduation from the Hawaii Military Academy in June 1980. 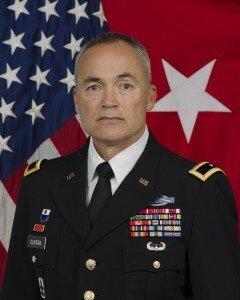 General Oliveira has served in a variety of command and staff positions in the 29th Infantry Brigade and the 25th Infantry Division throughout his career. He was activated for federal service on 15 August 2004 and served as Deputy Commander, 29th Brigade Combat Team in support of Operation Iraqi Freedom from 2004 thru 2006. In June 2007, he assumed duties as Commander, 29th Infantry Brigade Combat Team. On August 19, 2008, he deployed in support of Operation Iraqi Freedom, serving as Commander, Task Force Lava Thunder responsible for 3,100 Soldiers from Arizona, Oklahoma, Samoa, Guam, Saipan and the five major Hawaiian Islands. Student Services Coordinator, Hawaii Department of Education. This position is responsible and accountable for developing, implementing, and managing programs, policies, and services which respond to the academic, social, emotional and physical needs of all students.